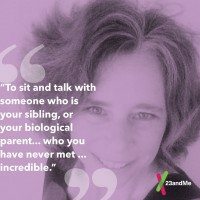 Several media stories in the last few months have highlighted the potential of 23andMe to help adoptees. One of the more touching pieces highlighted a woman’s 50-year search for the son she’d given up for adoption at 19. She was able to find him using 23andMe, only to lose him again to cancer. Another interesting story on PRI looked at Korean born adoptees using DNA to learn more about their ancestry. Inventor and scientist Thomas Park Clement, who was among the first wave of Korean adoptees to come to the United States in the 1950s, set aside a million dollars of his own money to cover the cost of other Korean adoptees who want to get tested. “Everyone on the planet has the right to know who their relatives are,” Clement is quoted as saying. Those stories and others highlight that while it’s not designed with adoptees in mind, 23andMe has become a resource for many wanting to fill in the gaps in what they know about their ancestry, their inherited traits or family history. For many of us we take for granted knowing this basic information about ourselves, but for many adoptees using a DNA test is the only way they could find out this kind of information. More Than Just Luck With the help of a genetic genealogist and her 23andMe results, a woman abandoned behind a grocery store as an infant is able to identify her biological mother. A Fantastical Story Not an adoption story, but this story tracks some of the same kind of ordeals adoptees have to go through to find out about their biological families. 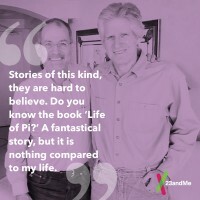 In this case, half brothers– one who lives in Brazil, the other in the United States – connected through 23andMe. Their story, which spans over several decades and includes some harrowing childhood trauma, ends with the two brothers meeting for the first time. Goodnight Son Not every reunion between an adoptee and his or her biological parent or sibling is a happy one, but for Mike Reed the meeting with his biological father couldn’t have gone better. His biological father welcomed into the family and introduced him to his nine half siblings. Putting It Together Abandoned in a laundry mat as an infant, Liz Kellner used 23andMe and ultimately found her sisters and biological parents. An Unexpected Discovery Cody tested to find out more about his health, but in the process he found his biological parents and half siblings. He also learned that he’d been conceived when his mother was a young teen and that’s why he’d been put up for adoption. It’s A Girl Although not an adoptee story, Kelli’s story highlights some of the anxiety many go through when trying to connect with a biological parent. They simply don’t know how it will play out. For Kelli the experience was a good one. She used 23andMe to help her find her biological father. Once she made the connection her biological father, who hadn’t known of her birth, welcomed her into the family. An Extraordinary Turn An adult son connects with his biological father and they become friends. 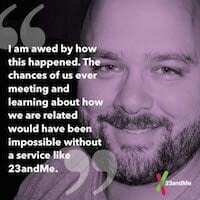 A Siblings Story Using 23andMe Tricia found her half brother and half sister. They were able to tell her more about her biological father and the three of them met and became friends.